After a night that was almost sleepless because of people talking outside my room to all hours and one or two mosquitoes biting my fingers and toes. I arose about 0400 with probably 2 hrs sleep to my name for the night. Half out of it, packing was done and the bike was wheeled out of the room. The girl attendant knew I was leaving early and kindly was ready to open the door onto the street. Once on the move my senses heightened, all was good, especially since the main road out of town was much less congested. It was a hot day in the making, 0530 saw the sweat building as was the humidity. Once rural areas were reached it was so relaxing not to be surrounded by the built environment. Out of town a bunch of mountain bike riders were out for a ride, many hills were in this area, holding conversation past a greeting was beyond me. One guy motioned me as to not wearing a helmet. I carry one. Since midway through Minnesota it has not been worn. They are so impractical when it comes to wiping persperation from ones head. As mentioned in an earlier entry their effectiveness in a heavy impact accident has been proven to be questionable. I am happy to agree. The police encountered for the best part of a year seem to have better things to monitor. My world was now shades of green, blue, black, white and yellow. The only real changes were the colours of the passing vehicles. The countryside is so luxuriant, deciduous trees are almost non existent as are sheep. The road was very busy with flashbacks reminiscent of Costa Rica. The camioneros here however, are much more courteous, I might add. 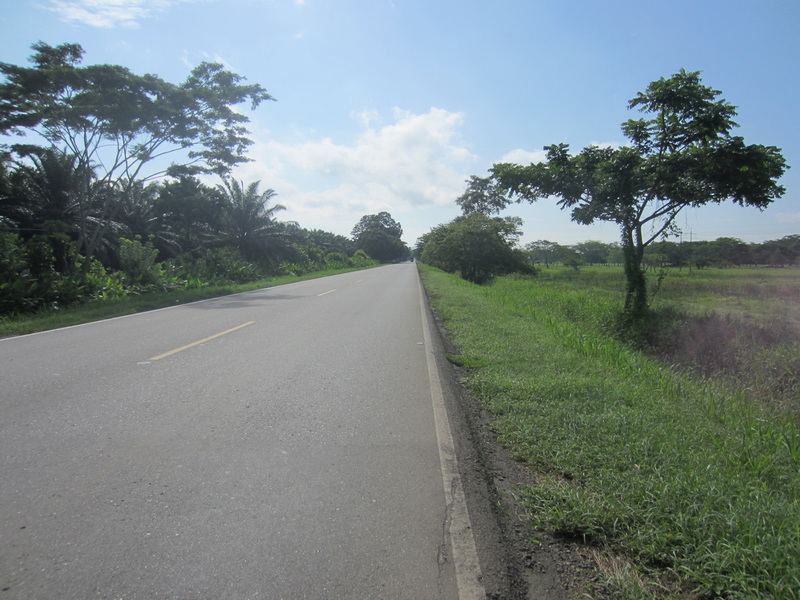 This is the main road between Barranquilla and Medellin. Riding on an elevated road south of Arjona, another cyclist joined me, he was riding from Cartagena for the day. Both sides of this road saw the edges of a vast wetland habitat. Waterfowl abounded as were fisherman at all the culverts crossed. The area was home to large snakes and caymans. The shoulder on the road was pretty much non existent. The humidity was now again getting close to providing a drink from the air, the temp was in the thirties, doing it tough best describes myself. All manner of drinks were being bought at most small shops. 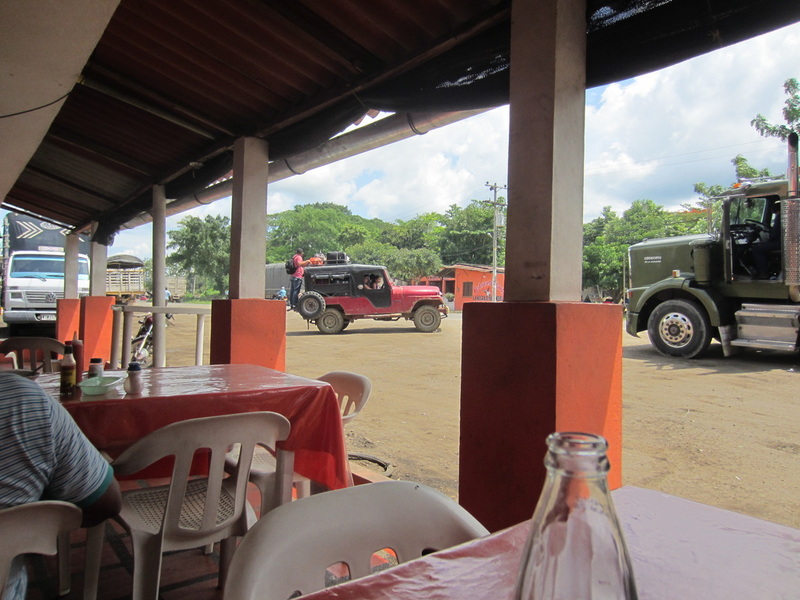 In the small town, San Cayetano, a couple of mangoes were enjoyed along with the obligatory sodas. They were great people, giving me more mangoes and providing a seat in the shade, they introduced me to their family and anyone that pulled up to buy something, these encounters always make the heat, humidity and the hills seem less significant. At a major intersection, guys were selling just the best icy, fresh squeezed orange juice to any truck that would stop. Myself relieving them of three of the above, at 50c each, they were such good value. 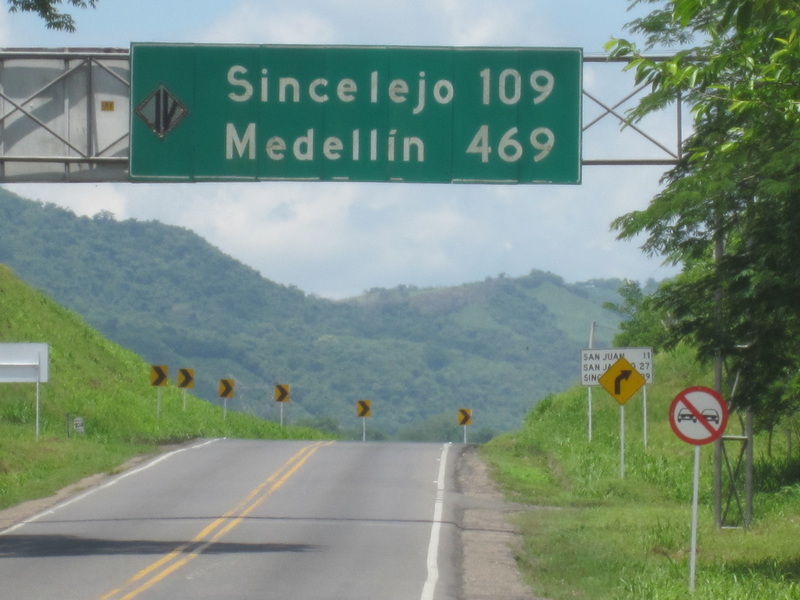 Spending some time here talking and laughing, moving on saw lunch enjoyed at a town mainly used by camioneros (truck drivers, always having trouble with this word, its use here will help). The hills were becoming more prevalent, there were times when 300-400m would see me pulling up totally at the end of my tether, always stopping under the overhang of a tree offering shade. It was this high humidity that was causing the discomfort. As usual anywhere camioneros eat, you can bet the food is full of carbs, energy and not short on meat, bingo, it was a great meal, in friendly company. Arriving at San Jacinto didn’t come to soon, my situation was that of total exhaustion, a motel was quickly found, a shower was had and just hanging about was my main activity there on in. The motel Hamaca Grande here comes highly recommended, it is new, very tidy and comfortable, Franklin the owner is a great guy. Anyone in town knows where the motel is. Though having air conditioning for me is a problem, firstly my fear of catching a cold and secondly it dries me out something awful whilst asleep. The fans are so much more comfortable and practical. A large meal of beef was enjoyed, as was watching the hundreds of motorbikes in town, these guys and girls have no problems talking or texting while on the move, very few in these rural areas choose to wear a helmet. It was not unusual to see a family of four on a bike. The guy texting, the kids on the phone and mum putting makeup on, well not quite!! 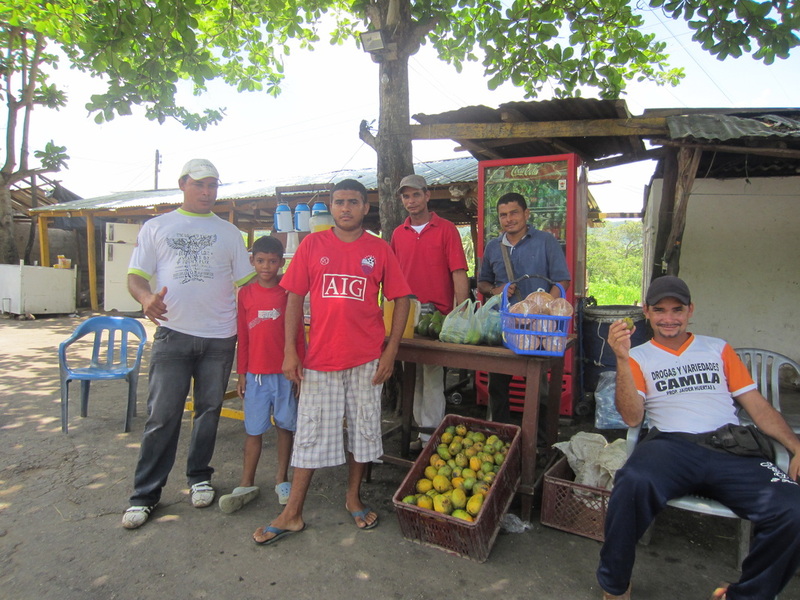 The orange juice boys, Barranquilla turnoff, you wouldn't drive past without having one of their icy orange juices.